The Friends of Brechin Town House Museum hosted an illustrated talk about celebrated Brechiner Sir Robert Watson-Watt pioneer of RADAR. Donations totalling £86 were made by generous members of the public and the Town House Friends added an additional £50 making an impressive total of £136 which will go towards the cost of the statue currently being constructed in Brechins St Ninian’s Square. The plinth is almost completed and the statue should be erected before the end of May. A BBC 2 documentary “Castles in the sky” about Sir Roberts’s life and work will be shown later this year with Eddie Izzard cast as Sir Robert. 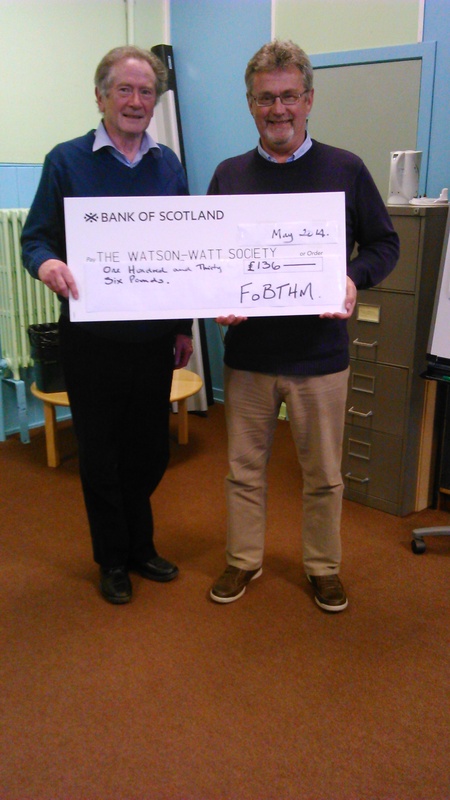 Brian Mitchell, Chairman of the Friends of Brechin Town House Museum presents the cheque to Mike Holland, Treasurer of the Watson-Watt Society of Brechin.